Members of L-D239, their families, friends and the community stayed the course on the picket line throughout the three-month lockout. 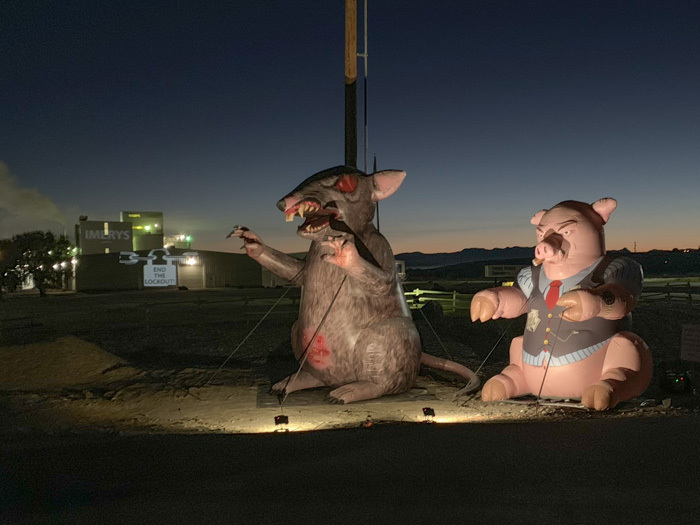 Lighting illuminates a menacing inflatable rat and pig outside the gates of Imerys Talc, courtesy of L-D239 and the International. An “End the Lockout” image is projected from the picket line onto the side of the Imerys mill. LOCAL D239 BOILERMAKERS are back to work in Three Forks, Montana, after a more than 90-day lockout by multinational Imerys Talc. The massive French-owned company locked out workers August 2, after the union refused to ratify a new contract that would have gutted key benefits and work practices. Imerys may have underestimated the determination of the lodge’s 35 union members. For more than three brutal months, L-D239 members proved they wouldn’t give up or be ignored. Despite going months without paychecks or employer health insurance, they manned a picket line day and night, every day, no matter the weather, steadily gathered allies and advocates, and made it clear they were in it for the long haul. At the same time, pressure against Imerys gained momentum; while extra security, plus scabs Imerys brought in from out of state in its attempt to temporarily replace the locked-out workers, drove up the company’s costs. “This was a hard-fought victory, and it’s a victory to be sure. In this lockout, the workers from L-D239 endured extreme hardships: no paychecks, no insurance, the daily stress of the picket line, constant uncertainty and the disappointment of a failed mediation attempt,” said J. Tom Baca, IVP-Western States, who, along with IVP-Southeast Warren Fairley and International Rep Miguel Fonseca joined L-D239 for the negotiations in October. It worked. Imerys agreed to go back to the negotiating table October 25, where the two parties reached an agreement to end the lockout. Days later, L-D239 ratified a new three-year contract that reclaimed most of the benefits and work conditions the union initially sought to preserve from previous contracts, including seniority and overtime provisions. Imerys agreed to a one-year extension before health insurance will no longer be available as a benefit to new retirees. The union agreed to drop unfair labor practice charges it filed against Imerys with the National Labor Relations Board. “I would like to especially thank IVP Fairley for his immense contributions during the negotiations,” said IVP Baca. “His experience, counsel and participation were integral to a successful outcome. Beginning in the first hours of the lockout, union members were joined on the picket line by their families, the community, politicians and other unions. In addition to support from local businesses and Boilermaker brothers and sisters nationwide, IndustriAll Global Union, the AFL-CIO (and the Montana AFL-CIO), the Montana Federation of Public Employees, the Montana Nurses Association and other unions championed L-D239, elevated awareness of the situation and stoked the pressure against Imerys. The International provided support for local members with signage; food; tents, a stove and wood; a trailer; a portable toilet; public relations help; a lock-out fund; and more. Boilermaker lodges and individual members gave generously to the fund. Beyond spurring support for L-D239, the lockout also prompted possible new legislation. U.S. Senator Jon Tester (D-MT) and Montana Governor Steve Bullock both visited the picket line multiple times, and the lockout inspired Tester to introduce a bill that would eliminate corporate tax breaks for companies like Imerys that lock out workers. 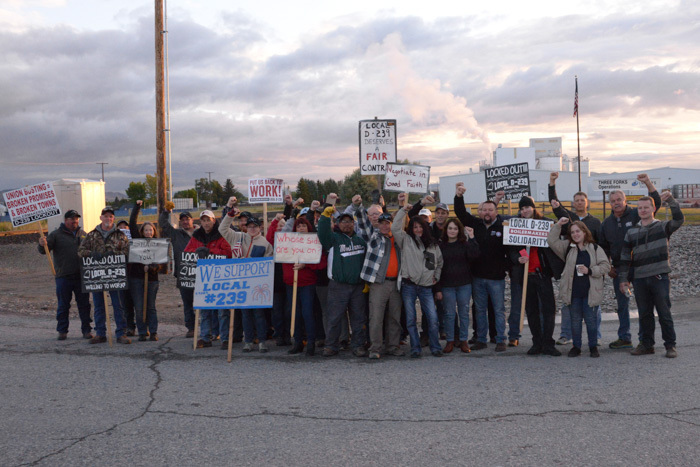 “Despite Imerys’ selling their workers downstream, hard-working families remained strong and united during this unjust lockout,” Tester said in a post-lockout news release praising L-D239. “We’re glad to be back at work,” said L-D239 president Randy Tocci. “And we’re focused on doing what we’ve always done: working hard and producing the best possible product for the mill’s customers. The picket line was not where we wanted to be.